We are thrilled to announce that Microsoft has heeded our collective call to do right and agreed to a replacement program for Surface Pro 4 devices that experience screen flickering. The replacement program can be found here and includes further information on how to prepare your device for shipping. 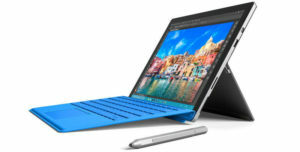 This move by Microsoft comes as a result of the large number of Surface Pro 4 owners who raised the issue of flickering screens occurring soon after their devices were out of warranty. Microsoft’s replacement program comes as a victory to Surface Pro 4 owners. Have you Experienced Screen Flickering Issues in your Microsoft Surface Pro 4? Many states have laws that allow for a consumer to recover for a defective product even if the defect occurs outside of the warranty period. If the screen in your Surface Pro 4 product has flickered, we would like to speak with you. Complete the contact form on this page or give us a call at (202) 470-3520. Along with screen flickering issues, Microsoft Surface Pro 4 owners are also reporting dead batteries and unresponsive type covers. As is the case with the Surface Pro 4’s screen, these issues occur after the warranty has already expired, leaving consumers with no recourse beyond out-of-pocket costs. Microsoft has posted troubleshooting guides in its support site, but they have frequently proven ineffective for many users.